Although the global app market is set to reach $ 188.9 billion by 2020, the percentage of successful apps still staggers around 0.01%. While certain application categories like shopping (+54%) and productivity (+20%) now boast longer sessions, the categories that did well in the past including mobile games and lifestyle have been in decline lately. 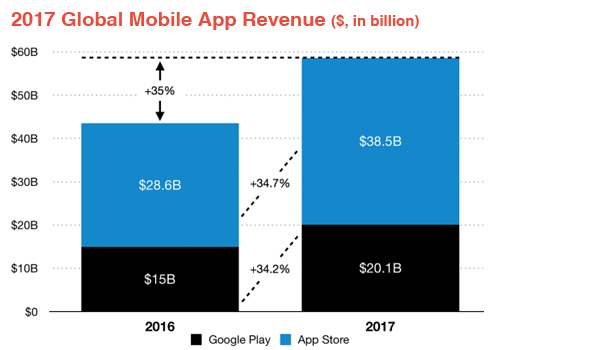 Contrary to early 2017 predictions, Google Play failed to outpace the App Store in terms of revenue and ended the year with $ 20.1 billion. Based on this data, it’s safe to say there’s still no tried and true way to monetize an Android app in 2018. Or is there? How to Monetize an Android app in 2018? App monetization is a topic that keeps on giving. However, talking classic freemium, paid apps and obtrusive interstitials is too 2014. Instead, I shall focus on less popular monetization strategies which are likely to dominate the global Android apps market in the near future. - Rewarded ads. According to Sensor Tower, Android apps were downloaded 64 billion times last year; that’s 16.7% up from 2016. The growth was primarily driven by emerging markets including India, Vietnam and Indonesia. Also, users from those countries tend to spend roughly 40% more time in apps than smartphone owners from the USA and Western European countries. But there’s a catch: the booming markets are a dead end for IAPs and paid apps. Sure, you can still make money on ad banners there. But there’s a way to monetize non-paying Android users and increase app retention at the same time. According to Tapjoy’s survey, less than quarter of users will stick to your app after the first week of ownership; with rewarded ads, app retention rates exceed 53%. Unlike irritating banners, rewarded ads are considered opt-in engagements. Every time a user runs out of virtual currency or wants to upgrade his account without paying a cent, he can watch a rewarded ad or take part in a survey and access the premium content he’s after. Speaking of in-app surveys, these pay up to 20x more than traditional ad networks!Also, surveys are a win-win solution in terms of feedback, analytics and A/B testing: there’s no way to craft better apps than listen to your users and continuously enable the changes they want to see. How to monetize your Android app like a pro? First, there’s the lack of flexibility which is essential to survival in emerging markets. In order to monetize as many users as possible – be it a user who spends $ 0.99 on a paid app or a guy who takes the time to promote a freemium application on social media – developers have to implement several monetization strategies simultaneously or adopt different monetization models based on a target market’s buying power and platform preferences. Second, there’s app discoverability which remains a huge problem for smaller development studios that don’t have $ 100-200 thousand to push their apps to the upper regions of Google Play charts through ads only. Ways out? In 2018 and beyond, forward-thinking developers should consider alternative Android stores like 1Mobile and Aptoide or even mobile app outlets. Third, the average price of a mobile game and single in-app purchase will probably rise this year. In a world where it costs anything between $ 400 thousand and $ 1 million to build and market a decent Clash of Clans clone, developers are bound to get their money back somehow. As a result, the number of users who make in-app purchases (which is estimated at around 2% in mature markets like the USA right now) will decline even further. At last, the time users spend in mobile apps has started to stagnate. According to Flurry’s recent report, overall app session activity grew by only 6% last year (down from 11% twelve months ago). Also, users now spend their mobile time across a diverse variety of apps including new ones. It doesn’t take a genius to put two and two together: most mobile app users aren’t happy with ads, microtransactions and the lack of quality content! If you dream of commercial success, you should put users first and develop a flexible monetization strategy long before your dev team gets down to coding! Think outside the “paid-freemium-ads” box, and success will follow! Andrei Klubnikin is Senior Content Manager at R-Style Lab – a custom software development company (IoT, Web, Mobile) with a business office in San Francisco, CA and dev center in Belarus, Europe. Andrei has been a tech blogger since 2011 and currently writes for several websites including Gamasutra, SmallBizClub, IndieWatch, Business2Community, MyCustomer, Tech.co, Mobile App Daily, GameAnalytics, etc.